Anna is a Wellcome Trust Sir Henry Dale Fellow in the Department of Chemistry and the Institute of Chemical Biology. Anna is the first holder of this fellowship in the Department of Chemistry at Imperial. 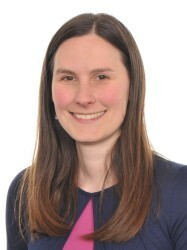 After graduating with an MChem degree from Durham University in 2008, Anna began a PhD in Chemistry with Professor David Smith at the University of York on self-assembling dendrons with applications in gene delivery which included a research visit at the University of Illinois. From 2012, she worked as a post-doctoral research associate with Professor Andy Wilson at the University of Leeds for 2 years on the development of novel inhibitors of protein-protein interactions. She then carried out a post-doc at Imperial College with Professor Ed Tate for one year before starting a Junior Research Fellowship at Imperial in October 2015. For more detail about our work and group members please see the Barnard Group website.